Santa may rely on Rudolph to guide his sleigh on Christmas Eve, but its best to let your own good judgment be your guide through this year's holiday season. Emergency room nurses see the results of careless actions every day of the year, but the holidays seem to land more people than usual in the ER, says AnnMarie Papa, immediate past president of the Emergency Nurses Association. "This can be a hectic time of year, and it's not uncommon for people to let their guard down or overlook basic health and safety measures as they travel, entertain and celebrate," she says. Nothing says Christmas like a real tree, says Rick Dungey of the National Christmas Tree Association. 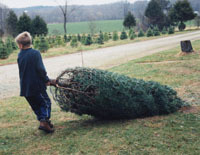 However, you should take several safety steps to ensure your tree stays fresh." Your first priority is to get a good tree stand that holds at least 1 gallon of water for any tree up to 6 to 7 feet tall," Dungey says. "In many conditions, trees can absorb a lot of water. The more your stand holds, the less likely it is to run out of water." Once you get a tree, cut a small disk horizontally off the bottom of the tree trunk, especially if there is any doubt that this was done for you by the tree retail location. "Get the cut surface in water within about three to six hours," says Dungey. "Add water at least every day, no matter how much it has absorbed. "Never let the cut surface of the trunk be exposed to air, and avoid displaying the tree in places that can speed up moisture loss from the plant tissue, such as next to heat vents, fireplaces and south-facing windows," he says. The rate of water absorption will vary throughout the time your tree is displayed, Dungey says. "Some days it will absorb a lot, some days not so much. This is normal. It can take some time for the plant to come out of a state of dormancy. Just keep the stand filled with water because it can absorb a lot of water in a short period of time once it starts." Prevent fires by using only nonflammable decorations, suggests Papa. "Keep all decorations away from candles and other heat sources. If you do use candles, buy them in jars or other containers to avoid open flames." It's not surprising that many holiday accidents involve either the very young or senior citizens. If you have small children who might knock ornaments off a tree, choose plastic over glass or hang fragile ornaments out of their reach. Try to avoid decorations that look like food or candy if small children are around. Many holiday accidents involve either the very young or senior citizens. A toy with small parts is a choking hazard for youngsters "if it will fit through a toilet paper roll it is too small to let a child play with," says Papa. "Holiday cards and toys with button batteries are becoming an increasing problem. Those batteries are small enough to swallow, and they will corrode. They can erode through a child's esophagus and even his or her stomach and cause major damage." If you feel unprepared to host small children, have their parents walk around the house with you, Papa says. "They know their children best and can identify the dangers you might not have noticed." When preparing for older guests, turn the lights on. Since it gets dark earlier during December, be sure the outside of your home is well lit, says Nancy Thompson, senior media relations manager for AARP. "Inexpensive solar ground lights are easy to find and install around your entrance," she says. "Repairing or resetting crooked paving stones is a weekend investment in everyone's safety," she says. "A bench near entrances for resting or setting down packages helps, too. "Put brighter light bulbs in your lamps, especially bulbs that don't produce excessive glare, and put another lamp or two in the guest room," says Thompson. "Visitors, especially older visitors, need more light to get oriented. Install night lights in all areas of night activity, and make sure that stairs are fully lit." Mom and Dad might take medicine, but children don't know the difference between brightly colored pills and Christmas candy. "Medication, whether yours or guests, should be kept in a secure, childproof location," says Papa. "Encourage visitors with medical conditions to provide you with contact information for their doctors and a list of the medications they take." Simply using extra common sense will help to keep your loved ones happy and healthy this holiday season, says Papa. "Remember, we want you to spend the holidays with family and friends, not in the emergency department with us."